El Rio Community Health Center will open the new El Pueblo clinic built by BFL Construction Company, Tucson, at Irvington Road and Sixth Avenue. 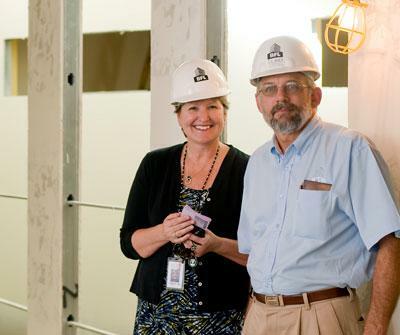 Cutline for Photo: Nancy Johnson, left, COO with El Rio and Ken Sand, project manager with BFL Construction check on the progress of the new El Rio Clinic. As El Rio Community Health Care Center celebrates 40 years of service, they want to send the message to businesses and others in the region that it’s not the healthcare provider you might think it is. Just like the industry itself, El Rio is keeping up with technology and providing cutting edge services. While experts both inside and outside the industry are still wrestling with the details of health care reform legislation passed by Congress this year, officials at El Rio say they’re gearing up to be ready for what may come. Johnson said she doesn’t believe that patients who were previously uninsured and now will have access to insurance will leave the community health center’s clinics. About 62 percent of patients served by El Rio are at or below the federal poverty line. In other words, 38 percent are above that level. Today the health center serves more than 73,000 patients annually at its 16 patient clinic sites. Those patients make nearly 300,000 visits annually. The center has an annual budget of $75 million and does about $11 million in charity care every year. Johnson said El Rio will be positioning itself as a health care home site and providing much more integrated primary care service as it continues to grow. This way patients can see multiple doctors or get necessary check-ups on the recommended schedules without having to make multiple appointments. One example is a new system they are testing with pediatrics that began last week. When a child has an appointment, and through electronic medical records El Rio staff can see it’s been a year since the child has seen the dentist, they will have a dental team available to see the patient immediately after their doctor appointment. She said this model is intended to change the focus of health care away from strictly diagnosing diseases and addressing the health of each individual. In December, El Rio will open the new El Pueblo clinic at Irvington Road and Sixth Avenue. It is the second clinic in as many years El Rio has opened – the other is the Southeast Clinic at 6950 E. Golf Links Road opened last year. The new clinic has 51 exam rooms and will house multiple disciplines to follow the integrated primary care model. The El Rio Santa Cruz Neighborhood Health Center opened its doors in October 1970 on Congress Street west of Interstate 10. The center renovated a former Pima County Juvenile Detention center with a $100,000 grant from Pima County and was initially set up to serve 10,000 residents. The service boundaries then were from Grant Road to the north, Silverbell Road to the west, 29th Street to the south and Park Avenue to the east. To ensure that residents knew about the clinic, staff walked the neighborhoods in the service area and handed out flyers and talked to residents about El Rio. The first year’s budget was $500,000 and there were 50 employees including doctors, dentists, nurses, nurse practitioners, lab, X-ray, pharmacy, social workers, community health workers and bilingual support staff. Now, 40 years later, El Rio employs more than 700 people and it is the 14th largest community health center in the United States by the number of patients it serves. While many health care providers have come and gone over the years, several of them have been with El Rio for the majority of its life. Drs. Gerardo Carlos and Steven Rosenfeld are two such doctors. The duo opened the El Rio OB/GYN Associates clinic, now at 225 W Irvington Road, 23 years ago. They were doctors that El Rio couldn’t afford but had a need for. “They were just coming out of a bankruptcy at the time and they had been designated as having a manpower shortage in the area of OB/GYN,” said Carlos who got his first job with El Rio in 1978 as a pharmacist before heading back to school for obstetrics and gynecology. Carlos and Rosenfeld were both in the National Health Service Corps — a program designed to help with the repayment of student loans in exchange for working in community health clinics designated for needs in the areas they specialize in. The two set up shop on the campus of Carondelet St. Mary’s hospital — which was also in need of OB/GYN specialists — and basically had to set up and build their own clinic while contracted by El Rio to provide care to their patients. The OB/GYN Associates site has delivered anywhere between 15,000 and 20,000 babies over its 23 year lifetime. Today they deliver around 1,000 per year. Carlos and Rosenfeld are often on-call for the clinic site and they deliver babies at all hours of the night. The duo could have gone anywhere and have each has received offers for new scenery with more money, but they’ve remained where they are because they believe in the community health center model. Some of the smiles Carlos and Rosenfeld receive have been serviced by Dr. Greg LaChance, director for El Rio’s dental division — who also came to El Rio as part of the National Health Service Corps in 1980. When LaChance took over, there were three dentists and two dental hygienists. Today there are 11 dentists, 10 hygienists, one pediatric specialist, one oral surgeon and a number of dental residents because the facility is a teaching site as well. Congress Clinic, 839 W. Congress St.
Congress Dental, 839 W. Congress St.
MEL Center Clinic, 5101 S. Liberty Ave. Summit View Clinic, 1900 E. Summit St. Contact reporter Joe Pangburn at jpangburn@azbiz.com or (520) 229-8751.